I recently finished reading The Secret Life of Bees, a novel published 15 years ago and made into a movie in 2008. (I’m quite behind on my fiction reading.) One of the characters in the book, May, was described as having a “condition” that made her feel everyone’s pain as if it was her own. She was an empath, in other words. This character learned to manage her pain by building a sort of wailing wall. When she felt overwhelmed by painful events, she would write it down on a piece of paper and leave it in the wall. We are all affected by the pain of others. I believe we all have a little bit of May in us. When we hear of tragedies or violence on the news, it affects us. Photos of children fleeing Syria moved us. Hearing stories of how other women were harassed sickened us. Learning about yet another police shooting angered us. It’s not a condition. We are still connected to the pain of others, no matter how far away they are. We need a way to deal with that pain. Sometimes we react by tuning out and shutting down. It’s too much to bear. We close our hearts, become filled with fear, and maybe push people outside our circle away. We can start to deny or ignore our connection with our fellow human beings in order to limit the pain we’re exposed to. We need to find a balance between maintaining our compassion and connection to the human condition without being overwhelmed. I’ve written before about dealing with personal pain here, here, and here, but how do we handle other people’s pain? Events we can’t control? Develop your own personal ritual. Write it down and burn or rip the paper up. Carry a stone on a walk and throw or drop it somewhere. Light a candle. Say a prayer. Give the pain a place to be. Take action. Take whatever action you can, whether it’s donating money or getting involved with a cause – even if it’s unrelated to the event. Connect with others. Develop a ritual with others. Talk about what happened. Take a walk together. Connect. Spend time in nature. It is grounding. It helps put things into perspective. Practice a loving kindness meditation. Find a guided meditation here: https://www.tarabrach.com/guided-meditation-loving-kindness-2/, on yogaglo.com, or elsewhere online. I’ve recommended this before. It is the meditation equivalent of a cure-all. 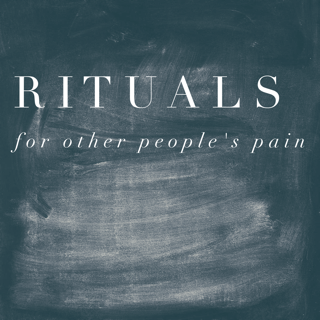 Do you have a ritual for dealing with other people’s pain? What works for you?